Still frame from Incoming, three screen video installation, 52 mins 10 secs, with 7.1 surround sound. Abstract shot of the sky at dawn over Gaziantep, southern Turkey. This scene shows footage of live battle with mortar fire in a village near Dabiq, Northern Syria. Dabiq was preordained in the Koran as ground zero in a great final battle between Sunni Jihadis and their heathen enemy, and is a resonant symbol in Islamic State ideology. This battle raged between FSA and US allies against IS positions near the Turkish border. A few days earlier, on 14th April 2016, nearby Iqdah refugee camp had been bombed and burned by IS forces, displacing civilians who had already fled fighting in Aleppo. They fled to the border, near where the battle for Dabiq was underway, but the Turks had closed the checkpoint, enforcing the frontier with sniper fire. Croatian Navy assisting in the rescue of refugees in the Mediterranean Sea off the coast of Libya, alongside Italian Navy and Guardia di Finanza ships. These refugees had been at sea for eleven days, moved from boat to boat under cover of night by human traffickers, until their rescue. A Syrian dentist told us there had been fights over food and water supplies, and he had been forced to assist a woman in child birth with no medical supplies, using only olive oil. Detail shot from inside the Flight Deck Control room showing the hand of an Aircraft Handling Officer rearranging scale models of each of the USS Theodore Roosevelt's seventy aircraft around a perspex layout of the ship's deck — what is known amongst crewmen as the 'ouija board'. At this time, USS Roosevelt was forward deployed in the Persian Gulf, carrying out bombing runs on IS positions in Iraq and Syria. A column of crew members aboard USS Theodore Roosevelt aircraft carrier conduct a deck walk, inspecting the surface of the deck, looking for debris which could be sucked into the jet intakes of the aircraft and cause damage. Naval Flight officers, also known as 'shooters', watch an F-18 fighter taking off from the aircraft carrier's deck by steam propelled catapult. The temperature on deck on this day in the Persian Gulf was 150° Fahrenheit (65° Celsius) with 90% humidity. There are frequent cases of dehydration among deck crew. A volunteer lifeguard from Team Humanity scans the sea's horizon off the coast of Lesbos, searching for refugee boats in distress. At this time, in Oct-Nov 2015, there were more than eighty refugee dinghies landing on the island of Lesbos per day, each packed with between 60-80 people. Many run into trouble, stalling, taking on water, or sinking. The heat traces left by the hands of refugees and volunteers is revealed on the hull of a dinghy used by refugees to cross the Aegean Sea between the Turkish city of Ayvacik and the coast of northern Lesbos. The landings are frequently traumatic as well as cathartic. They are dangerous and emotional for these refugees, many of whom have never before seen the sea. Unscrupulous human traffickers increase their fees to cross in better weather conditions. Poorer refugees are forced to cross in high waves, stormy weather, or by night. The cost scales from €200 to €1000, depending on conditions. An emergency worker attempts to revive a hypothermic refugee whose boat had sunk off Lesbos. An estimated 100 refugees had died in this tragedy, when the boat's upper deck collapsed, causing injury and panic, resulting in the hull to break apart and sink in rough weather. More than 300 refugees spent hours drifting on the waves, until they were eventually picked up by the Hellenic Coastguard with the assistance of volunteers and local fishermen. Brought to the port of Molyvos, many were drowning or hypothermic. The emergency worker is literally rubbing heat into the victim's body to try to warm the refugee up and save his life. Filming in darkness, the heat camera reveals the warm life-giving hand print. A young Syrian female refugee in the moments following the landing of her boat on the shores of the European Union, on the island of Lesbos. An Afghan refugee wearing a mylar thermal blanket on the island of Lesbos. Mylar blankets are often given out by volunteers to save the lives of refugees after their dangerous and sometimes hypothermic sea crossing. Refugees, surrounded by volunteers, gather their belongings after landing on the shore of Lesbos, and prepare for the long walk to the island's capital, Mytilini, to register their arrival in the European Union. According to the Dublin Convention, refugees must apply for asylum in the first EU nation that they arrive at. But most refugees attempt to make their way north from Greece, through the Balkans, to Germany and other more affluent nations. Long lines of refugees made to sit in lines at the port of Mytilini, on the island of Lesbos, prior to boarding large ferries chartered by the Greek government to carry them to Athens. A pathologist on the island of Rhodes with a body bag containing the corpse of an eleven year old female refugee who had drowned off the island of Leros. The body had been lost at sea for about a month, before being recovered. Fish had eaten the tissue around her face leaving only her skull, and her body was badly decomposed. To identify her, pathologists extract a section of femur bone from the corpse's leg, which is then sent to a lab to extract DNA information. This is then entered into a computer database, and hopefully a positive match will be made with the families of those with missing relatives, each of whom have sent blood samples used to enter their DNA into the same system. The DNA database has successfully brought closure for surviving relatives whose loved ones had disappeared on the dangerous journey to Europe. An Eritrean refugee watches as his tent burns in the Jungle refugee camp, Calais. Refugees and volunteers burned the camp in protest, as French CRS riot police forced the camp's inhabitants onto buses, and began to dismantle the camp architecture in October 2016. Firemen from Pas de Calais attempt to extinguish the blaze started by refugees and volunteers to protest the dismantling of the Jungle refugee camp architecture, October 2016. Compagnies Républicaines de Sécurité (CRS) riot police watch while the Jungle refugee camp burns. Traces of the thermal face and hand prints left by worshippers at the gate of a provisional Eritrean church inside the Jungle refugee camp in Calais. This image was taken in the final stages of the dismantling process of the Jungle, hours before the church was pulled apart. An Islamic refugee from sub-Saharan Africa lost in prayer at a brief truck stop in the Sahara Desert, northern Niger. This was filmed in total darkness, the man remained unaware of the camera's presence. Each week, large refugee convoys of more than a hundred pick-ups and trucks travel together for security from Al Qaeda in the Maghreb, on their way north for the Libyan border. Once there, the refugees usually spend a year or two saving money to pay human traffickers to send them on the dangerous Mediterranean crossing bound for Europe. A trader at a refugee transit hub in the Sahara Desert. These traders would offer refugees, riding on the back of pick-up trucks or larger lorries, soft drinks, fast food, batteries for flashlights, cheap clothing, and black market currency exchange. A large truck laden with goods, refugees, and their luggage, crossing the Sahara Desert heading north for Libya. Travelling overland in the Sahara Desert has become extremely dangerous, due to ambushes by Islamist groups and bandits. It is a lawless place. These routes are also used to smuggle drugs (mainly cocaine) north to Algeria, and weapons south from Libya to Mali and other countries. Refugees from sub-Saharan Africa nations travelling north on the back of a lorry crossing the Saharan Desert bound for Libya. Traffickers instruct their passengers to hang on, as they do not stop to rescue those who fall off. The International Organization for Migration estimates that the same numbers of refugees die crossing the Sahara as they do crossing the Mediterranean. Incoming charts mass migration and human displacement unfolding across Europe, the Middle East and North Africa. War, persecution, climate change, and other factors have contributed to the largest migration of people since WWII. Incoming intercepts two of the busiest and most perilous routes. One from the east, from countries such as Syria, Iraq, and Afghanistan, crossing Turkey, and arriving in the EU on the shores of Aegean islands, then passing through the Balkan corridor on the route north. The other is from the south, from countries in the Sahel region – Senegal, Mali, Nigeria, Niger, Chad, Sudan, Ethiopia, Eritrea – crossing the Sahara Desert for Libya, where they attempt to cross the Mediterranean hoping to reach Italy, often continuing north for countries such as France, Germany, the UK, and other wealthy nations. 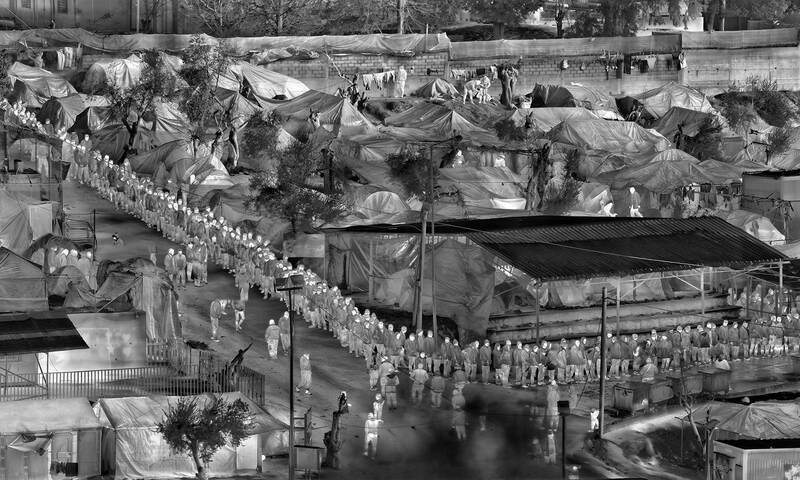 "I used a military-grade camera designed for battlefield situational awareness and long-range border surveillance in an attempt to confront the viewer with the ways in which our governments represent – and therefore regard – the refugee. We wanted to use the technology against its intended purpose to create an immersive, humanist art form, allowing the viewer to meditate on the profoundly difficult and frequently tragic journeys of refugees. This idea of heat, imaging heat, which we hoped would speak sideways about human displacement resulting from climate change and global warming — it also spoke more practically, even indexically, about the struggle of the refugee. Refugees literally leave the heat behind them, exposing themselves to the elements, the cold sea waves, the winter rain and the snow. Homes are replaced with tents and shelters. People die of exposure. Light is visible heat. Light fades. Heat grows cold. People’s attention drifts. Media attention dwindles. Compassion is eventually exhausted. How do we find a way, as photographers and as storytellers, to continue to shed light on the refugee crisis, and to keep the heat on these urgent narratives of human displacement?"